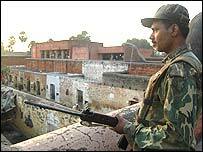 Maoist rebels have raided a jail and set free at least 35 of their supporters in the eastern Indian state of Orissa. Two policemen and three rebels were killed during a battle at the armed police camp after the attack by nearly 100 rebels on Friday morning. The rebels have taken three government officials hostage. Left-wing rebels, known as Naxalites, have stepped up attacks in many Indian states in recent months. The rebels launched simultaneous attacks on several government facilities, including the jail in Udaygiri town, the BBC's Sandeep Sahu reports from state capital Bhubaneswar. They cut the telephone lines of all government offices in the town. Police officer Banamali Mishra told Associated Press news agency: "We cannot tell the exact number of [rebels] killed as the extremists took away the dead bodies of their colleagues along with them." Police in Orissa had said that they were increasing security at all jails where Maoist rebels were being held following a raid on Jehanabad jail in the state of Bihar in November, in which more than 300 inmates were freed. Earlier this month rebels attacked a train in the eastern state of Jharkhand, holding more than 40 passengers captive for 12 hours. The rebels, who say they are fighting for the rights of the poor, have also launched a number of attacks in the central state of Chhattisgarh. Reuters reports that in the latest attack in Chhattisgarh on Friday rebels cut the throats of four members of a state government-backed anti-rebel group in the region of Bastar, over 200 miles south of the state capital, Raipur.